Pura Ulun Danu Braten is a Hindu temple located on the shores of Lake Bratan located close to the centre of Bali. 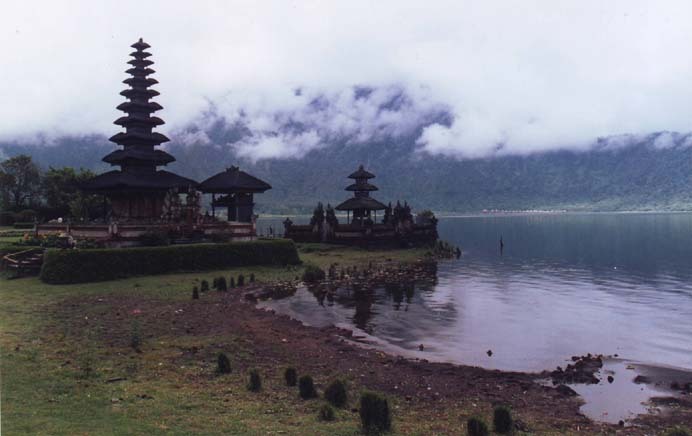 Pura Ulun Danu Braten is a temple dedicted to Shiva, one of the 3 holy trinity of Hinduism. The main structure of the temple is the 11 tiered Hindu pagoda, with many smaller shrines located around the tempe grounds close to the lake. Lake Bratan is located just north from the centre of Bali, on the main road that travels from the south to very north coast of Bali. The Pura Ulun Danu is located in the small town of Bedugul. There are a few hotels in Bedugul if you want to stay the night. Some of the best photo opportunities of the temple are at sunrise and sunset. Check out hotels close to Bedugul. If you are traveling from the southern area of Bali on your way to Lovina then this is a must stop place which is just over half way. When you enter the temple grounds there are other stranger photo opportunities but unfortunately some of the locals use exotic animals like large pythons, lizards and various types of monkeys to attract tourists to get their photo with the animals. These animals should be in the wild, not handled all day for the chance of these locals to get some money. Very close to the Pura Ulun Danu Bratan is the Bali Handara Golf Course. Check out the Pura Ulun Danu Bratan Temple website for upcoming festivals and events. From Kuta it will take around 2 hours to drive to Pura Ulun Danu Bratan. From Lovina, on the north coast of Bali, it will take around 45 minutes to drive to Pura Ulun Danu Bratan. From Ubud it will take around 1 hour 30 minutes to drive to Pura Ulun Danu Bratan.